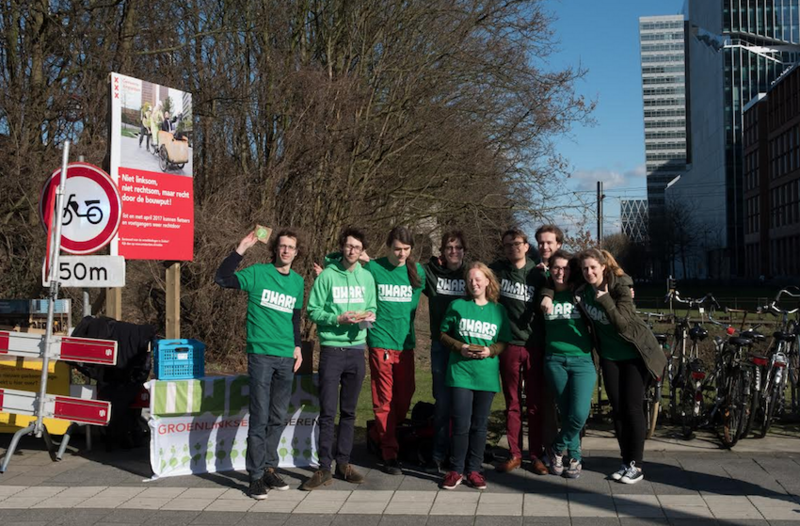 Last weekend I spoke to a girl handing out flyers for GroenLinks (GreenLeft) in the city of Utrecht. She told me with genuine astonishment that there were people coming to the square, which was packed with campaigners, to get a sense of what the different parties stand for. To me it didn’t seem such a bad idea, to talk to flyering volunteers while scoring a VVD lollipop, an SP pen, a D66 apple, and a PvdA rose. But the campaigning girl found it a bit odd, because really they weren’t there to talk about views. Recently I had to explain to a university student what’s the difference between left and right in politics. She knew the Dutch parties, but didn’t have a clue what they wanted. A newspaper headline last week: ‘A week to go, and the campaign is in crisis’. Subtitle: ‘Everyone just wants to know why it isn’t going better.’. The article proved itself: the campaign is in crisis, because it’s only about the campaign itself. There’s talk about the lack of an “Asscher-effect”, getting a new leader didn’t do much for the prospects of the PvdA (labour party), and about polls in which the VVD (liberal party) is stuck at a marginal distance from the PVV. And of course, in his absence, everyone speaks about the absence of Geert Wilders. Policy is not as mediagenetic as popularity, so it’s ignored. Even election debates, that really should be about views and opinions, get partly wasted on the question why the campaigning, and about the polls. They’ve been impossible to escape lately, those polls. Party leaders get thrown heaps of praise upon, or are written off, purely based upon a snapshot of some opinions. Differences within the margin cause headlines. And once in awhile, there is a ‘counter voice’: an article or item doubting the polls. Brexit, the election of Donald Trump, time and time again they are mentioned to show that polls aren’t holy. But, didn’t we know that already? Representative sample, error rate, polls influencing polls, we’ve heard it all. Voting strategically is a response to polls. Pessimism or optimism, maybe even Wilders’ idea to barely campaign ‘conventionally’, all based on virtual, hypothetical, numbers. And then it turns out, according to the polls, that our blond xenophobic friend doesn’t even need the conventional campaigning circus to do well in the polls. While the rest was debating, Geert Wilders drank a beer in Volendam. And his polls didn’t suffer from it. While the entire political establishment, the group Wilders says he wants to disassociate himself from, keeps pointing out that he doesn’t have any realistic plans. Which is true, and a big problem. But during election season his opposition doesn’t get much further than shouting their opinions either. It was fun to see how it went in Utrecht. Everyone in their own colour, with their leaflets and their gimmicks. But who really stole the show was a man with a multicoloured hat, holding up a sign saying ‘CHOOSE FOR JESUS’. He wasn’t flyering. Campaign posters should be abolished. ‘Choose for change’, like GroenLinks wants you to do, or ‘seize power’ with the SP, or ‘act’ (period) ‘normal’ (period) with the VVD; what do those sentences mean after the elections? Let’s please not vote for one liners. To distinguish yourself you don’t have to be contentless, you don’t have to fit your party line on an A4. In our ‘polder’ country a lot of parties differ mostly in the details. Polarizing is useless. Wouldn’t it be great if we chose to talk about ideals in the first place, instead of polls and angry ads? Then maybe we could even start speaking with some nuance. If politicians stopped shouting and making empty promises trying to stand out, they wouldn’t have to say sorry every time they fail. And the flyering volunteer won’t have to be so surprised when voters come to talk. Tagged campaigning, Donald Trump, DWARS, Geert Wilders, GroenLinks. Bookmark the permalink.